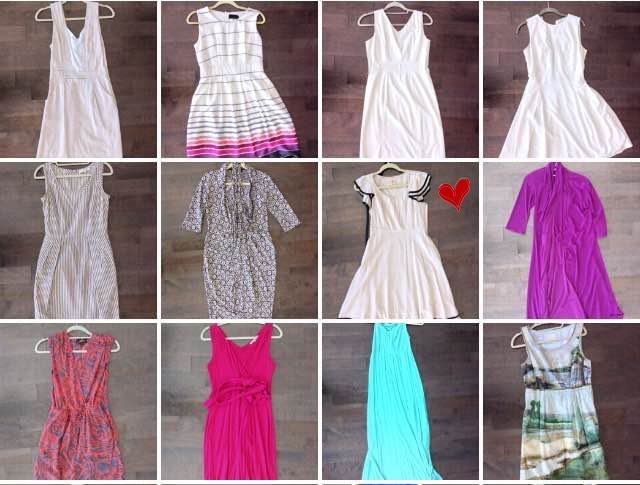 Luxe Minimalism: Closet Inventory – Dresses (Part One) | Save. Spend. Splurge. As part of my rehab from shopping mindlessly program (e.g. #LuxeMinimalism), I decided to also take stock of what I own, and go through each individual piece to talk about why I am keeping it, how often I’ve worn it, and what it costs. Busy enough to stop thinking about shopping, anyway. I obviously like short-sleeved or sleeveless dresses over long-sleeved ones. They’re easier to dress up with another coat, sweater, etc. I consider that I can wear any dress to work with a sweater over it to cover my shoulders if it is too revealing. Now for which dresses were secondhand, or gifted? The dresses above marked with red hearts were thrifted or gifted. The company is unfortunately now no longer on Etsy but I bought the dress for $35 and it is just lovely. I originally bought it because I wanted a simple, neutral shift dress (without it being too business-y and office-like), and this fit the bill. I really like the white t-shirt fabric near the front which adds interest, and the pockets are fantastic. Dresses should have MORE pockets than they do these days, who doesn’t need a good pocket? I am keeping it because it is still a light, comfortable summer dress that is easy to wear, not revealing at all when I bend over and looks casual and yet stylish with a Tilley hemp hat. I also enjoy dressing it up a little with shoes and belting it as you can see below. L.L. Bean Linen dress is the closest match I’ve found to the one above since that original Etsy shop has recently folded with a more expensive option is this Philip Lim one that hits the stripes and shape perfectly. I love this dress even though it is 100% cheap polyester and VERY plastick-y feeling. It’s just so pretty. I love the gradient of colourful stripes near the bottom, and the whole girliness of it without it being too Rainbow Brite. I don’t wear it as often as I should because in the summer it is stiflingly hot to do so, but then I forget about it for the Spring, Autumn or Winter because.. it just looks so summery. I like that it’s also a good dress that could quickly double as a fancier going-out or event party-type dress of which I have very few in my closet (for good reason, I don’t have many events to attend). If/When I wear it to work, people ask me why I’m so dressed up because it’s slightly shiny too, but being dressed up is my thing and I won’t apologize for it or be a slob. I always feel a need to belt it too… not sure why. This is a dress I bought quite a while ago, I think even before I started noting what I bought, so it had to be around 2009 or so, near the start of my career. Anyway, I bought it because a white sheath dress never goes out of style. I’ve worn it over and over again to the office, it’s been too big on me after I lost about 20 pounds in recent years, so I had it tailored down to fit me better. It has a great neckline, a V that is not too deep nor too high, and it is just chic. It’s from a brand called Tristan and one of the few dresses I own made in Canada. It looks great belted, or just as-is. I also sometimes wear it as the skirt.. it’s loose enough. I bought this dress on a whim in Manhattan and just really liked the high neckline (unusual for me) and the structured bodice that had the feeling of it being boned but was not at all. It feels almost like a tennis dress which is interesting. I find it hard to accessorize in terms of belting it however, so I tend to wear it bare, or with a very skinny belt. I am not 100% sold on it. I still keep it because I like wearing it, but I find it hard to wear unless it’s just by itself and I tend to like to add things like belts or necklaces and this dress is too minimalist for that. I’m wavering on selling it. This dress is a dream. It’s like a crinkled cotton of sorts, and it is COMPLETELY MACHINE WASHABLE (how amazing is that) without needing to be ironed. The look of the dress is to be a little rumpled. I love the odd inverted pleating in the front and the pockets (oh yes, POCKETS). When I first bought the dress from the saleswoman, it was way too long. It came past my knees as a midi dress. She tried to talk me out of tailoring it to be just above my knee but I couldn’t be swayed. Midi lengths in that kind of casual dress with a ballgown sort of bottom, look terrible on me. I only like midi length skirts if they’re tighter pencil skirts and more fitted. Otherwise I just look.. squat. As I saw it, it was going on my body so I was going to wear it the way I wanted. I also really love Comrags in general. They have an interesting, unique outlook on clothes & when I find a piece that sings to me, I buy it. Out of all the Bionic dresses by Mark Foreman (Toronto designer) that I own, this one is my favourite. I bought it just out of college and have worn it ever since. It fits perfectly, the collar is great, the fabric is polyester but of a good quality, and it has sparked my love of wrap dresses. It also fits well if I go up a dress size, which is the beauty of wrap dresses. I really love this dress. I bought this from someone secondhand who no longer wanted it. It was a size too big, so when I got it, I had it tailored immediately in the bust and shoulders (bringing it up and tightening the middle). I feel like I don’t wear it often enough but when I look back at my instagram shots, I apparently reach for it more often than I think. At any rate, I find this very hard to belt if you don’t use the belt that came with the dress (black velvet, shown in one of the images below). Any other belt looks.. off. The dress has trimming in black, and the belt has to be a skinny black. End of discussion. I also find it very girly and very feminine and the only way I can wear it to work is if I wear something over the top so I cover the flutter sleeves and tone down the sugar. It’s also a b*tch to iron. It has 3 layers and you have to iron each one individually or else it looks wrinkled and sloppy. I guess that’s why I don’t wear it as often. I don’t want to wash & iron it afterwards. HAHA. This colour is one of MY colours. I look great in it. I own it in a jacket, a scarf, two casual jogging jackets and in all of my accessories you will see this hint of deep, vibrant purple. I just love it. And a dress completely in purple? WOW. I had shopped for this with a good friend of mine and I clearly recall her face when I stepped out of the dressing room. She said: Wow, the first grey dress you had on was nice, but this one is.. you have to buy THIS ONE. I of course, bought all 3 of the dresses I tried on, but over the years have sold or given away the other 2 and kept this one. This is why you should always go shopping with a friend. This is a fabulous dress. I remember clearly the day I went shopping for this dress. I was with another good friend and I was NOT PLANNING AT ALL on buying it. I just saw it, and the salesgirl and my friend at Mendocino convinced me to try it. My response: I hate orange. I’m sure I will hate this dress. ..then I try it on and realize how brilliant it was. It had draping near the waist that is subtle but flares out and balances my wider shoulders. It had a nice wrap front, POCKETS (!!) and was in 100% silk. I also didn’t hate the orange and grey on me. I did however, hate the price tag. It was at the time, the most I had ever considered paying for a dress and I did not want to spend any money… but gave in because I have no willpower as a shopaholic, but you know what, I’m glad I did! I bought this one random summer downtown. I saw it in the store, could not decide between teal or this magenta, and decided I owned too much blue and teal (true story, wait for Part Two) and took the magenta. It’s a great Mommy dress. I wear it with a tank top underneath (it is rather revealing when I bend over) and it is comfortable as a jersey faux wrap. I wore it a lot when I was out with Baby Bun. I love the pink colour story in this one, this one is great too, and I REALLY WANT THIS version of my magenta dress which is like a dead ringer in a new, updated silhouette. Target was having a fire sale when they were being chased out of Canada and by chance I stopped by to see what I could salvage. I spotted this dress on the rack in the maternity section no less, and thought: that is a cute maxi dress. Bear in mind, I had only one maxi dress in my life and got rid of it because I couldn’t walk in it (it had no side slits so it kept getting wrapped around my legs and hindering my walking). I gave up on maxi dresses until I saw this one. $10.90 on sale. How can you possibly go wrong with $10.90? NOT AT ALL in this case. I picked it up right after I saw how flattering it was, even without a baby bump. I love the braided shoulders, and it just looked so elegant on me and only $11. Not only that, I was really into Game of Thrones that summer having discovered it, and was having illusions of being Daenerys Targaryen and this dress was something she could wear. Right?! I bought it because it was on sale, at first. I was at Anthropologie browsing the sale rack and came across it. It was just so COOL. Like an old painting in a dress. I love anything with cities, villages or landscapes on them, so this was just fantastic. It is actually a little awkward around my broad shoulders as it is a boatneck rather than being a straight shift, but I had it tailored slightly to bring it up so that it would be less awkward. Not much else I can do with it. It is great as a skirt too. Thank you so much for that link to the linen dress, and it was on sale too! Now I can happily replace my polyester dress for the summer. I love the first white dress so was sad the first link didn’t work. It’s weird that the tennis style dress you struggle to style, given it’s similarities to the first dress and how you can style that. The white/cream dress with black details and ruffles – I’d totally wear that sort of details to work, though I don’t wear dresses. It’s weird what ‘girly’ I’m ok with (arm ruffles) and not ok with (centre ruffles like your blue dress). I didn’t like the ombre coloured dress on it’s own, but with that black belt, I suddenly loved it – strange how an accessory can change your mind! I really struggle with the tennis one only because of the neckline. It feels so high to me, and I am used to v-necks. That dress for me with the arm ruffles or front ruffles are girly with a capital “G”. I find them hard to wear to work. Haha 🙂 Belts solve everything. I loved all the layering and outfit ideas here that I could apply to my own wardrobe. Love the striped dress (& it looks totally office appropriate, not too dressy!). The wrap dresses and also the turquoise maxi are also beautiful. I really like reading closet inventory type posts. All the dresses are great, but that first dress is really lovely. Going purely off what it looks like on the hanger, it isn’t something that stands out, but then it looks really great on, and it suits you well. As someone who isn’t very good about using belts in my outfits, you come up with some really good dress and belt combos. My favorites on you are 3, 5, 6, and 12. I love a good print or a nicely structured dress. All the wrap dresses you own give you a fantastic shape. Love the post – more like these please. Yes, wrap dresses give me some sort of darn curve 🙂 I am straight up and down and I need some curves so I belt and use wrap dresses.